In the context of world events, the recent publication of Harper Lee’s Go Set a Watchman is tinged with irony. It should never have been published, at least to a public readership, and it’s doubtful Lee approved of its release. It’s not a prequel or sequel as has been shamelessly claimed. It’s an early draft of the romantically conceived 1960 classic To Kill A Mockingbird, which like every critically successful and enduring novel, was collaboratively produced by a great writer and a sympathetic editor. However, now that the genie has been let out of the bottle it is inescapably interesting to hear what one must assume is Lee’s raw and unadulterated voice as a younger story teller during the late 1950s. The character she drew in an early sketch of the novel’s protagonist, Atticus Finch, is both repugnant and disturbing: ‘Do you want Negroes by the carload in our schools and churches and theaters?’ Atticus asks. ‘Do you want them in our world?’ Sadly, it seems the answer for some folks is still no. The UK based Telegraph has published a timeline of recent controversial police shootings and assaults of black Americans, documenting the social unrest and mass protests these incidents have given rise to. The controversy continues with the June murders of nine black church parishioners committed by a white civilian in South Carolina, and the alleged suicide of a young black woman, Sandra Bland, in a Texas jail on July 13, precipitated by her harsh and unjust arrest. Not since the race riots of the late 1960s has America experienced such a convulsive crisis of faith in its national identity as a racially harmonious society. A recent NYT/CBS pole on race relations America seems to support this dim trend. As is to be expected, the focus of this public trouble has been on issues of technical legality of the law, smoking-gun evidence of victimisation, poor policing practises and broader issues of race and social justice. But drowned out by the myriad voices and debates has been this curious question: Why now? What almost all of these incidents have in common is that they have been filmed and uploaded on the Internet, enabling them to be rapidly circulated around a wirelessly connected world at magical speed. 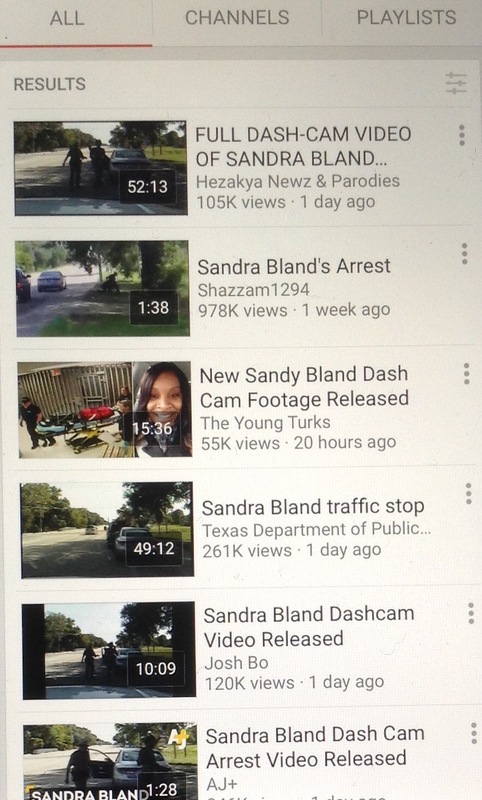 Two remarkable things are taking place here: evidence of alleged police victimisation is being recorded as events unfold, by a CCTV camera or personal mobile device, and then shared at a faster rate than can be sanctioned by governments or controlled by commercial broadcasters, thereby transforming a terrifying provincial episode into a world wide media event. Law and order is increasingly on the back-foot because control over the one thing that the state’s authority has historically been premised upon, ownership and management of the flow, quantity and quality of information, has dramatically collapsed. This is a largely new phenomenon made possible by the convergence of video camera enabled personal devices and social media platforms, such as YouTube and Vimeo. Despite the legal gains made by the civil rights movement in the 1950s and 1960s, and regardless of the fact that some of the leading figures in recent American history have been black, including the current leader of the free world, what evidence do we have that victimisation of black people has abated over the last six decades? The cowardly bashing of Rodney King in 1991 by the LAPD was exceptional not because it signalled a violation of some kind of wishful truce between blacks and whites, but rather because it happened to be captured on home video by a member of the public, and circulated globally on television; arguably setting the precedent for the YouTube videos of police shootings and assaults that have gone viral, even as we speak. A little over half a century ago, a relatively obscure communications theorist, Marshall McLuhan, coined the catch-phrase ‘the medium is the message.’ What he meant was that the then new electronic technologies such as the telephone, radio and television, cultivated an increased depth of involvement, pace and scale of human interaction, and that this had personal and social consequences for everyone. As mentioned earlier, there are bigots amongst us who would prefer to contain the involvement of black Americans and their advocates (and indeed any marginal group) in the coursing of their destinies, but the Internet and the smartphone, and other electronic technologies, are taking that choice out of their (the bigots, that is) hands. Let us us conclude by remembering that great daydreamer and author of Ragtime, who passed away only just last week: Mr Doctorow is dead. But the spectre of Coalhouse Walker still haunts us.